Our friend, Liz Owens, wrote this absolutely perfect email, that we would like to share. A baby's first birthday is as much a celebration of the little person as it is for their family. Our friends, Adam & Jamie, started their daughter's first year journey much earlier than they anticipated. Jamie went into labor when she was 28 weeks pregnant. From that point on, she was stationed at Children's Hospital in St. Paul. Their littlest lady arrived two weeks later. When Violet was born, she weighed 3 pounds, 4.55 ounces and was 16 inches long. I've attached one of Violet's 2-week photos in her dad's arms. You can't help but notice Adam's wedding band. Amazing, isn't it? A combination of answered prayers and the expertise of the NICU doctors and nurses resulted in their baby's homecoming less than seven weeks after her birthday! And now? She's an almost one-year-old! 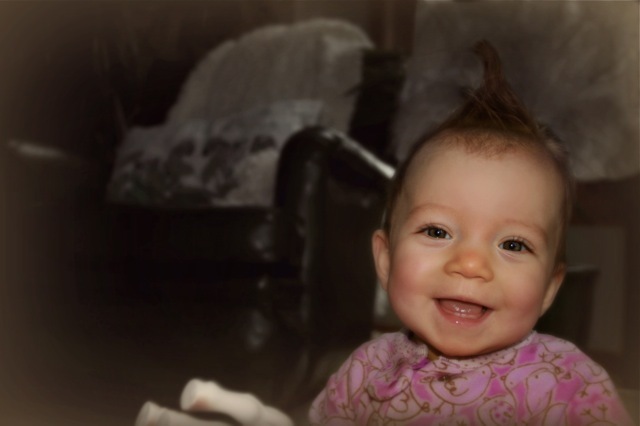 A sweet little sister to Sylvia, who crawls, pulls herself up, and she even sports a mohawk barometer (when she's happy, you can tell!)! Every year, the neonatal services unit at Children's Hospital hosts a 3K walk to reunite the kids with the NICU staff and to raise money for this incredible facility. Coincidentally, the event lands on Violet's birthday week-end! We are thrilled to be a part of Team Violet and would appreciate your fundraising support as we celebrate her and her family! While based on birth age, Violet has been a bit slower to develop some of the "firsts", it is still pretty cool watching those happen no matter when they finally do take place. When I was traveling last week, Jamie noticed that Violet pulled her self up on a stool in the girls' bathroom. Well, after being home for about 30 minutes, Violet had to show dad her new trick as well. She pulled herself up on the ottoman without any real issues, like she has been doing it for some time. We look forward to sharing more and more firsts as this little one continues to grow and mature. This morning Sylvia came in to check on Violet when she woke up. They like to have a bit of sister time in the morning. Violet is teething so I told Sylvia to be careful so Violet didn't eat her. She told me that bones are hard to chew so Violet would need more teeth to eat her. Smart kid! Our little one is almost a year old! The last couple of months have really been a blur. It seems that each day she is growing more and more. A little over a month ago, Violet had her first real bout of any major illness. After several visits to the clinic, we finally gave in that it is "just a virus" and there is nothing we can do but wait. It took much longer than we wanted, but she is finally back to normal. Well, whatever normal really is. While we don't have an official weight, we know she is over 17.5# (that is what she weighed on her visit to the clinic for her virus). She has also become much more mobile over the past month. Similar to her older sister, she started with the backwards crawl. We got a couple sessions on the video camera, but haven't transferred them yet. So between rolling, bending, and backwards crawling, she can get to were she needs to go. During her stint with the virus, her mohawk had gone away. However, we are glad to report that once she started feeling better, the mohawk returned! It seems that her hair, coupled with her kicking legs, is a great way to judge how she is feeling. We are looking forward to enjoying the next three weeks, cuz on June 3rd, we will have a one year old!